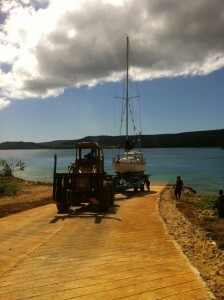 The BoatYard is the newest addition to Vava’u’s and Tonga’s growing array of marine orientated industries. Ideally located in an old quarry, The BoatYard sits 20ft above mean sea level and is protected on three sides by steep hills and the old quarry face. Access to the water is gained via a gently sloping slipway. Our hydraulic trailer has been custom built by Hostar Marine in the US and has been specifically designed to meet the needs of the cruising boats that visit our waters as well as the local marine operators. It is capable of handling monohulls and multihulls up to 30 metric tonnes and 60ft smoothly and efficiently. The BoatYard is committed to preserving the environment. From recycling bins to waste water filtration systems, The BoatYard is striving to minimize its impact on the local environment. Working with VEPA (The Vava’u Environmental Protection Association) we will be sponsoring various programs including a coral tray project. The BoatYard has also committed itself to annual self assessments to be shared with the Ministry of Environment, thus guaranteeing that the best possible standards are adhered to. As a nation that lives on the water, The BoatYard has recognised that it has an important role to play in supporting the local communities. The BoatYard is working with members of the local Fishermen Council so that we can best support their needs, especially during times of emergency such as cyclones. We have also committed to work with the Tongan Voyaging Society to try and return ‘Vaka Moana’, the traditional sailing canoe, to Tongan waters and re-introduce the next generation to Tonga’s great sailing traditions. Follow the voyaging society here. The BoatYard is a brand new yacht haulage and hard stand facility in Vava’u, the first in Tonga, and has turned Tonga into a safe year-round cruising destination!